As I recall, it was a chilly December day when I was surfing through various folders in First Class (our Board’s communication system) and I came upon the flyer for TMA ~ Teacher Mentors Abroad. Our ESL Learning Coordinator, Denise Taylor Edwards had posted the flyer and one of our Literacy Coordinators had taken part in the experience last summer. I read it and for some unknown reason decided to compile the necessary application requirements and send them off. So here we are now 6 months later and I have recently arrived home from a week that has had the most profound impact on me, both professionally and personally and unlike most experiences which seem to beg for immediate reflection (which in my case means a blog post) it has taken me quite a few days of quiet reflection ~ away from everyone and everything ~ before beginning to string together my reflections in a coherent manner. My plan is to dedicate my next few posts to the experience in the hopes that others may find something which resonates with them and their own experiences. For the sake of context, here are a few of the bare bones components of TMA. Teacher Mentors Abroad started 10 years ago as a joint venture between Nancy Lorraine, a native Dominican Republican (more about this incredible dynamo later) and Jose Lopez, a pastor in Hainamosa (one of the poorest villages in Santa Domingo). 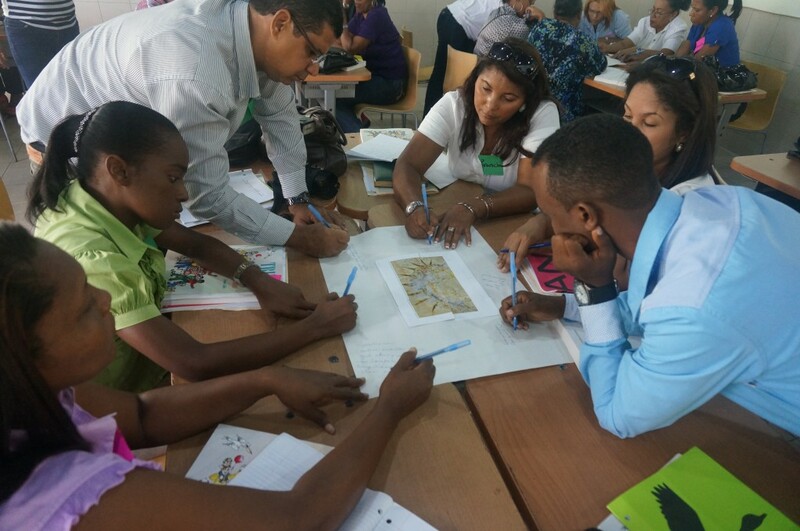 The premise behind the initiative is that by bringing Canadian educators to the Dominican, together we could build capacity within the ranks of the DR educators and they can take what they learn at a week long conference back to their school communities. Unlike our professional learning rich culture, the DR educators rarely are provided with the gift of professional development. 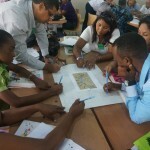 Up until this year, it was the Canadian educators who provided the components of the 4 days of workshops for school teams consisting of both teachers and administrators. This year, there were 10 DR educators who, after being involved in the program for several years, were brave and confident enough to co-teach with us (a team of 9 women~ 8 presenters and our team photographer, who is also a talented educator) The partnership was a monumental step towards building capacity among the DR educators. The conference included a politically charged plenary, 4 days of workshops wherein the participants rotated through sessions on Reading, Writing, Mathematics and Know Your Learner and a closing ceremony ~ complete with government representation and a wonderful dance routine from DR children. 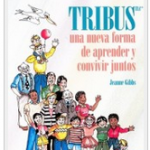 The organization has secured a deal with the publisher of the TRIBES book and each participant received a copy of the Spanish version of the book. 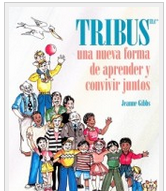 Each session effectively wove various TRIBES activities into the components, as the main thrust within the DR is to move educators into embracing a more collaborative learning environment for their students. I guess it doesn’t matter how close to the equator you are ~ some of the educational challenges are the same. 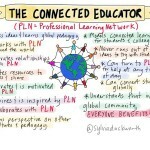 But in our case, we can’t blame it on lack of professional learning opportunities. Along with the conference, we had the opportunity to see the extremes within Santa Domingo ~ from the Colonial City, where Christopher Columbus landed and the first church built in the Americas, to the white sands of the beach to the depths of poverty in Hainamosa. My usual travels to a Caribbean country had entailed a shuttle from the airport, off to the resort and then back to the airport. Following this experience, I will be hard pressed to repeat that pattern. Once you’ve seen so much, it is impossible to forget. For anyone who has been to a conference lately, I’m sure that positioned on one wall or displaying their work on a screen via a data projector there was a talented artist capturing the key components, phrases and resources with words, pictures and symbols in what has become known as a Sketchnote. 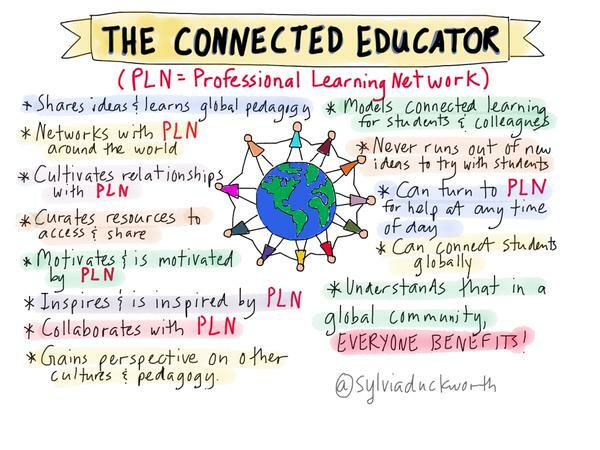 As you scroll through Twitter Feeds, you don’t have to scroll for too long before you see a Sketchnote, with Sylvia Duckworth being one of the most popular sketchnote artists, but the list of others using this strategy is growing. I find when I retweet one of those Sketchnotes, I receive a number of favourites and retweets, which speaks to the popularity of displaying information in this format. About 10 years ago, as a board we were beginning to embrace Instructional Intelligence strategies, with two of them being mind and concept maps. Hallways were decorated with a variety of maps as we started to support the idea of having our students making their thinking visible. When my daughter was studying for exams in both secondary school and university, she would create a concept mind as an effective tool for studying. So, lately I’ve started to wonder if concept maps and Sketchnotes are the same thing with just a different name and then today I came across this article which outlines the differences. I also wondered about the power of the Sketchnotes for my own learning and what better way to quench my curiosity than to give it a try. I’ll share that my first challenge was to work through my inability to draw. My maternal grandmother, my aunt and my mom have all been blessed with incredible artistic abilities. I have a couple of “go-to” simple drawings that have gotten me by, but the thought of capturing my thinking in pictures (which others may actually see) is scary, to say the least. The next challenge was to select the topic. As I don’t have any conferences in my immediate future, I decided to take a piece of blank paper and thin tipped marker to church on Sunday and “sketch” my way through the service. My background knowledge on biblical references is still in its infancy, so I find myself learning something new each week. Using Sketchnotes would be a good test to determine, not only my initial learning, but my ability to retain information. 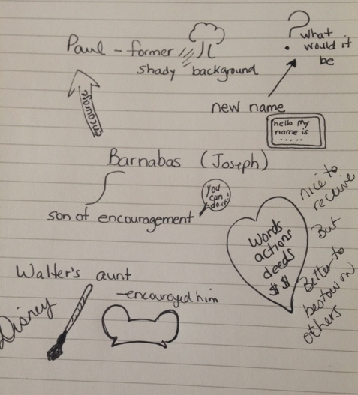 The topic was “Encouragement” and the life of Barnabas. I took too long to think about what I wanted to draw, so I missed capturing some of the message. I’m wondering how to better capture the train of thought. In looking at my notes I’m not sure that I could retell the story in the same order. As it took me awhile to figure out how to capture “shady”, I will always remember that Paul, was once known as a shady character. I will always remember that Walt Disney was encouraged by his aunt, who gave him his first drawing tool. As with all new learning, this was only my first kick at the can. I’ll keep you posted as I continue to explore Sketchnotes as a learning/teaching/sharing tool. 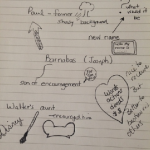 Have you thought about using Sketchnotes to capture your thinking? As summer holidays officially begin, I find myself returning to one of my most favourite routines. It starts with successfully recalling my public library username and password, followed by an online search with the following filters ~ “available”, MP3 version, known authors (Baldacci, Patterson, Brown to name a few) and ends with the successful completion of all steps involved with downloading a selected audio book to my iPhone. Ball cap holding back my ponytail, sunglasses poised, running shoes tightened, earbuds securely in place and I’m ready to hit the trails and press the play button. The narrator’s voice, like that of an old friend, begins and within minutes I’m transported from the trails to the setting of the novel, as if no time has passed from the last time we were together. And although my eyes are peeled on the trail, avoiding any potential pitfalls, my imagination is alive with visions of fishing charters, Monasteries, war-torn countries, exotic islands, state capitals and every other setting that my favourite authors select for their opening scene. I find myself getting lost in the creative vocabulary and twists and turns woven into the phrases ~ hoping to recall some of them to use in my own writing. These days my reading diet is relatively well rounded in terms of what I’m digesting and my intake methods. My day usually begins with my social media snacking ~ Twitter and Facebook articles which I send to my organized lists, retweet or share. My non-fiction “appetizers” include recipe books, magazines, newspaper articles ~ paper copies which I can skim and scan and quickly make my way through. For my professional reading (entrée) it’s good old-fashioned paper copies, with new spines ready to be cracked, which I find myself wanting to re-read, highlight and fill the margins with connections ~ these take much longer to digest. 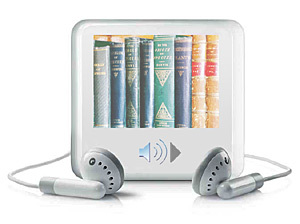 So, in continuing with the reading diet theme, I would have to classify my audio books as dessert. The plot lines are predictable; usually including a good guy, a bad guy, an investigation, a love interest, a plot twist and a relatively happy ending. And just like dessert is one of those guilty pleasures when it comes to my daily intake of food, my audiobooks bring great pleasure to my summer hikes. 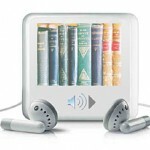 The value of listening to Audio books has certainly garnered mixed reviews. Knowing how much I enjoy this summer pleasure, I have to wonder why it stops when September rolls around. Maybe this is the year that I continue to treat myself to audiobooks well into the school year. 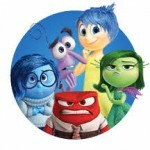 If you haven’t seen Disney/Pixar’s “Inside, Out” yet ~ you may want to wait and read this post afterwards! 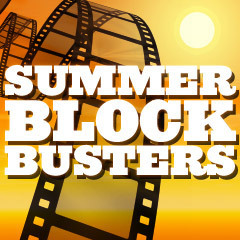 My first date was a city bus ride downtown to see the summer blockbuster Grease with Peter Kay. We had just graduated grade 8 (hence the city bus) and although I had already seen it a week earlier with a group of friends, I enjoyed it just as much the second time around. I think it was at that point in my life that looking forward to seeing an annual summer blockbuster movie became a tradition. Some of them are more memorable than others, depending on who I watched them with and the quality of the impact of the film. As my own children became old enough to sit through a feature length movie, another summer tradition was born. We would anxiously await the spring commercials advertising the upcoming children’s movie and then, once school was out, we’d enjoy a family dinner followed by a movie. Around that time Disney, Pixar and Dreamworks emerged as companies who were producing family films which coul d be enjoyed by young and old alike. 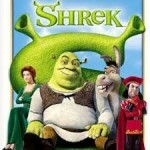 Toy Story, Finding Nemo and Shrek were so skillfully written that as the children were laughing at the high jinks of the main characters, the parents were laughing at the double meanings and adult humour. As my kids grew up, our summer tradition of family movie night became a distant memory. So I was ecstatic when, last week, my daughter, now 25, invited me to go and see this summer’s family blockbuster, “Inside Out”. I had watched the commercials on TV and was expecting a similar theme to that of Shrek ~ entertainment for the children and adult humour for the parents. What I hadn’t expected was that this return to family blockbuster viewing was going to take me on an emotional rollercoaster of memories of my own. As I watched the Emotions (Joy, Anger, Disgust, Fear and Sadness) work together to help Riley maintain her islands of Friendship, Family and Imagination, only to have them crumble, I found myself remembering a multitude of wonderful memories that I imagined would be a part of my daughter’s core memory bank. As the movie went on and Riley’s islands continued to crumble, I found myself wiping away tears, swallowing away a painful lump in my throat and sneaking sideways glances at my now young adult daughter, longing to return to the days of her childhood and those of her two brothers. As with all well-crafted story lines, the ending took me by surprise. Throughout the movie I found myself cheering for Joy, confident in my thinking that Joy’s quest to keep Sadness away from Riley was the noble thing to do ~ thinking that as a parent that was my job too! But it wasn’t until Joy’s shedding of a tear and her realization of the complexity of what factors were involved in making those interactions worthy of being core memories (which needed a combination of all emotions) that it hit me. Without sadness, joy cannot exist! We need to embrace each emotion, even the sad ones. So, in embracing the sadness as I long for the summertime traditions when my children were young, I look forward to the joy of creating new summertime traditions as they transition into young adults. Who would have thought that an animated children’s movie could have brought such clarity and meaning?